Smythe caught three of four targets for 14 yards during Sunday's 42-17 loss to the Bills. He ends the season with six receptions for 50 yards. Analysis: Smythe led the Dolphins' tight ends in receiving during the season finale, modest as his numbers were. The 2018 fourth-round pick progressed well in his development through his rookie season, and he even managed to overtake Nick O'Leary (listed as the No. 1 tight end on Miami's depth chart) in terms of offensive snaps during the last two games of the season. Likely to be primarily deployed as a blocker alongside Mike Gesicki, Smythe is a key part of the Dolphins' plans for 2019 and beyond. Smythe caught one of two targets during Sunday's 17-7 loss to the Jaguars. Analysis: Smythe led the Dolphins' tight ends in both targets and yards during the Week 16 loss. The rookie fourth-round pick has seen much of his usage as a blocker, but has looked solid as a pass-catcher when called upon. Though Smythe has not achieved fantasy relevance this season, he'll be an integral part of Miami's plans going forward. Smythe nabbed both of his targets for 27 yards during Sunday's 27-24 loss to the Colts. Analysis: Smythe recorded a career high in targets while also leading Miami's tight ends in receptions during the Week 12 loss. It's encouraging that the rookie fourth-round pick showcased some pass-catching chops, but he's unlikely to continue receiving offensive targets on a weekly basis. Heading into the Week 13 tilt against the Bills, Smythe is buried behind Nick O'Leary, A.J. Derby (foot) and Mike Gesicki on the depth chart. Smythe played in just five offensive snaps in Sunday's win over the Bears. Analysis: Smythe was dealing with an ankle injury late in the week, but he was ultimately cleared to play. 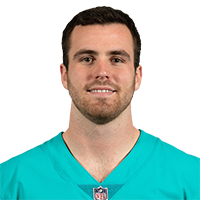 Smythe, however, is currently buried on the Dolphins' depth chart and will likely continue seeing very limited work unless more injuries hit the position. Smythe (ankle) doesn't carry an injury designation going into Sunday's matchup against the Bears, Armando Salguero of the Miami Herald reports. Analysis: Smythe popped up on the injury report Thursday with a limited participation in practice, but was able to practice fully Friday. While the Notre Dame product is third on the depth chart, he could see an increased workload if fellow tight end A.J. Derby (foot) misses time Sunday. Smythe was limited in Thursday's practice with an ankle injury, Armando Salguero of the Miami Herald reports. Analysis: This is Smythe's first appearance on the injury report this week, so it's likely he hurt his ankle during Wednesday's practice. Being simply limited, there's a good chance he still plays Sunday versus the Bears, but Friday's practice will be more telling. The rookie fifth-round pick has suited up for all five games, but he's failed to come up with either of his two targets. Smythe failed to catch his only target during the Dolphins' 38-7 loss to the Patriots on Sunday. Analysis: Smythe played only two offensive snaps Sunday, ceding the vast majority of Miami's tight end workload to rookie Mike Gesicki. Even if A.J. Derby (foot) remains sidelined for a significant amount of time, it's unlikely that Smythe will carve out a notable role in the Dolphins offense. 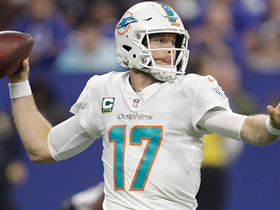 Miami Dolphins quarterback Ryan Tannehill finds tight end Durham Smythe for a 21-yard gain. 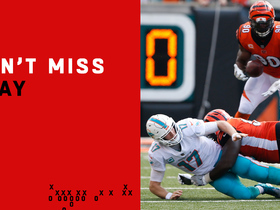 Cincannati Bengals defensive end Michael Johnson takes a Ryan Tannehill deflected pass back to the house for a pick-six touchdown.